From Cairns airport simply take the Captain Cook Highway north following the signs for Port Douglas. Turn into Port Douglas and follow Port Douglas Road for 1.5 KM then turn left into St Crispins Avenue. The drive takes around an hour from Cairns Airport to Pool. 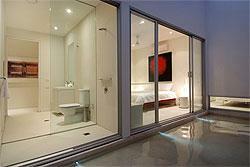 Sunset Apartment: Two Bedroom and One Bathroom Apartment with Balcony. Queen Size Beds in Both Rooms. Full Kitchen and Laundry Facilities. LCD TVs, Cable TV, Air Conditioning, Ceiling Fans. Mountain, Pool and Golf Course Views. Swim Up Apartment: Two Bedroom and One Bathroom Apartment with Direct Pool Access from Private Terrace. Queen Size Bed in Both Rooms. Full Kitchen and Laundry Facilities. LCD TVs, Cable TV, Air Conditioning, Ceiling Fans. Mountain Views. Uber Single Level Apartment: Three Bedroom and Two Bathroom Apartment. Queen Size Beds in all 3 Rooms. Private Internal Plunge Pool. Private Terrace with Golf Course and Mountain Views. Full Kitchen and Laundry Facilities. LCD TVs, Cable TV, Air Conditioning, Ceiling Fans. No cancelations or refunds within 14 days.